The farthing was a small silver and later copper coin valued at one-fourth of a penny. The name is derived from the Old English feorthing, from feortha meaning "a fourth part", probably from Old Norse fjorthungr meaning a "quarter". In 1279, Edward I (1272-1307) initiated a coinage reform throughout England. Prior to 1279, the only coin in circulation had been the penny, although it had been cut in half or quarters to make change in the form of halfpennys or farthings. 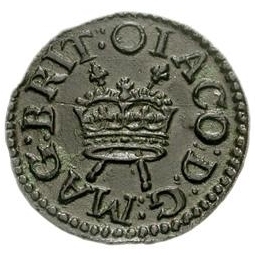 The reform introduced three more denominations; the groat (worth four pennies), the halfpenny, and the farthing. This farthing was small (only 10 millimeters in diameter) and very light (slightly more than 0.4 gram). The types and designs were identical to the penny...though legends were necessarily abbreviated to fit the smaller space. The obverse has the facing portrait of the king surrounded by a Latin legend proclaiming him king of England, France and Hibernia (Ireland). The portrait itself changed very little from reign to reign, so to the inexperienced eye, it tells little as to who the ruler is. The reverse has a long cross dividing the coin into four quarters with three pellets in each of the angles. The legend gives the name of the minting city. The farthing continued virtually unchanged with the exceptions of slight modifications of the portrait and the changing of the rulers name until the time of Henry VIII (1509-1547). The size remained the same but, by now, the weight was just under 0.25 gram. During the reign of Edward VI (1547-1553) a limited number of farthings were struck. These were under 9 millimeters in diameter and now of base issue. Coinage of the farthing ceased for almost three-quarters of a century. 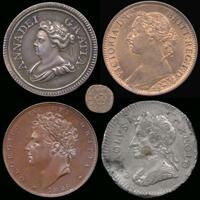 It was resumed under James I (1603-1625) but by now it had lost all silver content and was struck entirely in copper. Its diameter varied between 13 and 17 millimeters and the obverse bore a crown and two scepters and the reverse featured a crowned harp. After the Commonwealth, the obverse bore the ruler's portrait in profile while the reverse type was changed to that of Britannia seated on a rock or globe with the date at her feet. The diameter was now 23 to 25 millimeters. 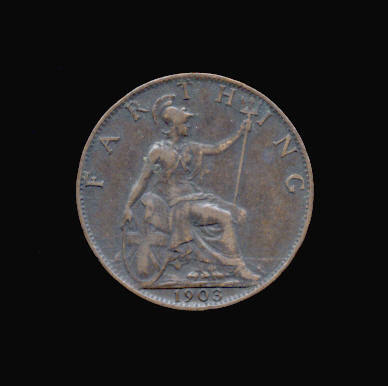 This farthing was minted until 1859 when, during the reign of Victoria (1837-1901), the diameter was reduced to 20 millimeters. The types, however, remained the same. In 1947 George VI (1936-1952) instituted a coinage reform that ended the minting of silver coins in favor of those of cupro-nickel. During the reign of George VI (1936-1952) the reverse of the current farthing was changed for the first time in about 230 years. (various patterns had shown different types throughout this long period but the reverse of the farthing issued for circulation had remained mostly the same) In 1937, Britannia was replaced by a simple wren. Britain adopted the decimal coinage system in 1971, but the low value of the farthing had caused the cessation of its minting in 1956. On this site can be found descriptions of the types of farthings along with photos where available.